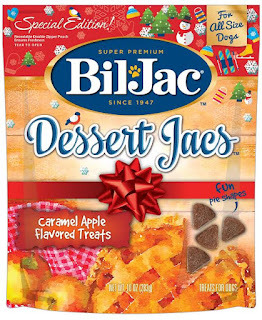 And, right now you can pick up the special edition Caramel Apple Flavored Treats from Bil-Jac to wrap and put under the tree, or add to your pup's stocking. I love the cute pie shapes, and how this snack is perfect for all size dogs. This also makes a perfect snack to pick up and drop off at a local shelter, too. I just found these at Petco and had to pick them up. The name alone is so cute...Yappie Nanas and PBnanas. :-) Both of my dogs love apple and banana snacks, so they will definitely be sniffing these out under the tree come Christmas morning. So, as you begin your crazy holiday shopping, don't forget your furry friends. They provide unconditional love every day of the year, and are always there to put a smile on your face. Make their Christmas morning with some tasty treats and food from Bil-Jac.